When it is time to patch, upgrade or service an ESXi host running VSAN, the first thing you will want to do is to place the host into Maintenance Mode. 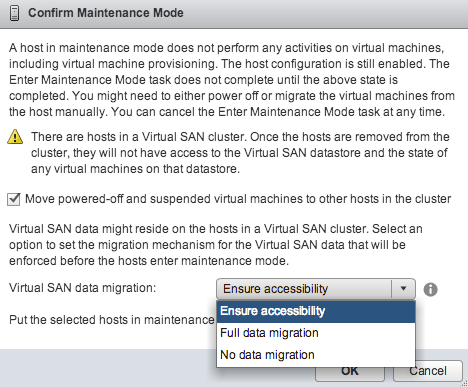 If you have never performed this operation on a VSAN host before, you should be aware that there is a new option to specify how the data for VSAN will be migrated. Below is a screenshot of the three options provided when using the vSphere Web Client.